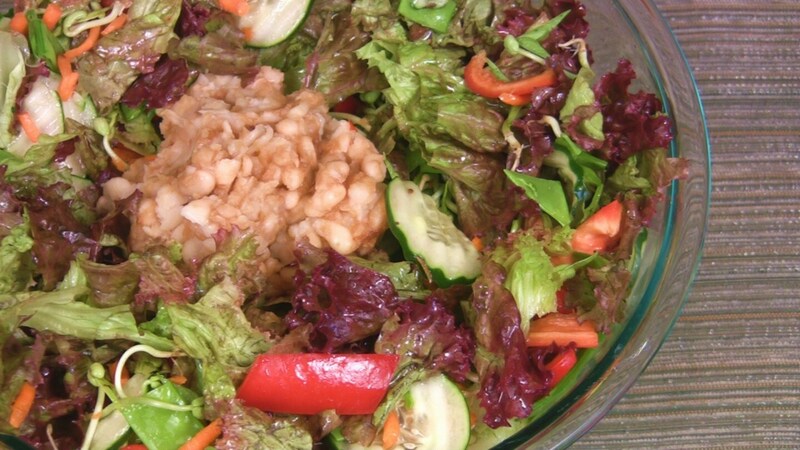 Served with whole-grain rolls, this vibrant salad is a meal in itself. It’s so low in fat and full of antioxidants, you'll feel healthier just looking at all these cancer-fighting power foods. Wash the lettuce and tear it into bite-size pieces. Dry it thoroughly in a salad spinner and transfer to a large salad bowl. Add the bean sprouts, snow peas, and cucumber. Cut the bell pepper into thin slices. Then cut the slices diagonally into thirds and add to the salad bowl. If desired, blanch the carrots in boiling water for 3 to 4 minutes to soften. Immediately rinse them with cold water to stop the cooking process and drain well. Add the carrots to the salad bowl. Toss well. If using the optional salad dressing, add it just before serving and toss again. Make an indentation in the center of the salad. Combine the vinegar, soy sauce, and chili paste in a medium bowl. Add the beans and toss until they are evenly coated. Spoon the bean mixture into the center of the salad just before serving.